Pauline Corpus: Horizontal Charts by Francisco J. Romero Carrasquillo (click to download). Rationale for the Project: The Ite ad Thomam Translation Project, in existence since 2009, and currently organized by STAGS, aims to make available in English translation some of the principal, representative works of Scholastic Thomism, including course manuals and commentaries on St. Thomas currently available in Latin through Ite ad Thomam's Out-of-Print Library (ITOPL). 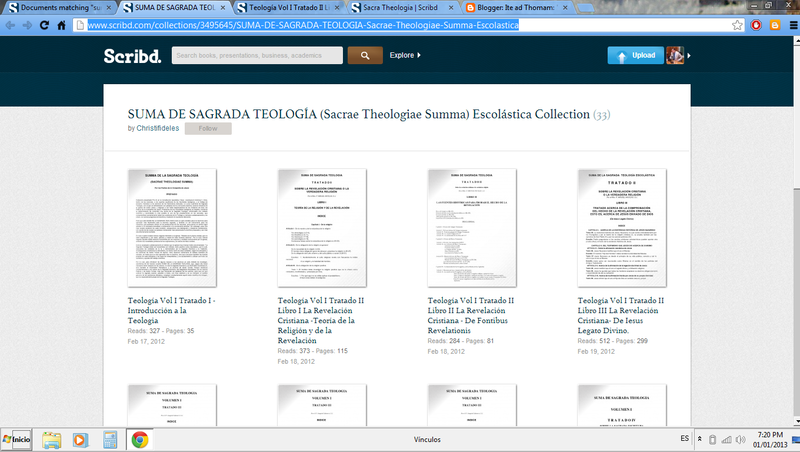 Traditionally, Thomists have presented philosophy and theology in Latin and in its native scholastic methodology. This methodology allowed philosophical and theological disciplines to advance objectively and in a scientific manner (understanding 'science' as Aristotle did), and the Latin language gave it the precision and universality it required for being transmitted effectively throughout the world. 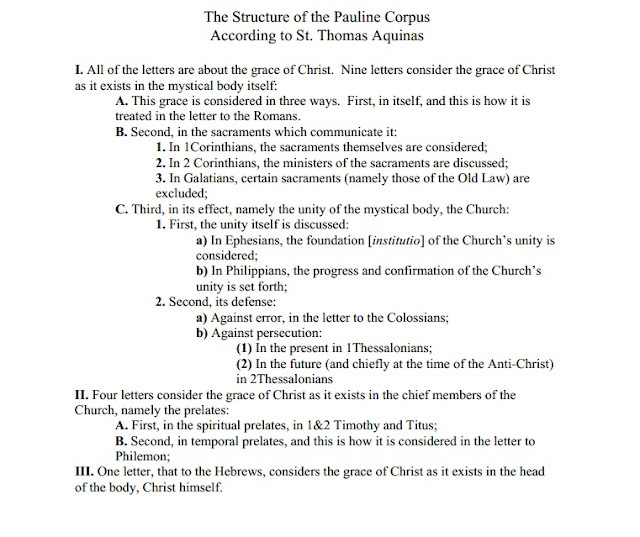 Since the turn of the 20th century, however, Thomists gradually began to abandon both the Latin language and the scholastic method that had characterized Thomism since its inception. The abandonment of the method has brought dire consequences for Thomism, for philosophy and theology, and for the intellectual life of the Church. Moreover, the abandonment of Latin has caused a linguistic gap between the novelty-ridden Thomism of today and the traditional Scholastic Thomism of past decades and centuries. The overall result is that the contemporary English-speaking Thomist, professional and layman alike, is generally not habituated to thinking scholastically, because he has no easy access to Scholastic-Thomistic works in English. Priests and seminarians no longer know how to form a solid theological argument, and as a consequence, have a difficult time defending the faith. Self-professed Thomists do not know how to utilize the very method that St. Thomas used. The result is that Thomism is derided, and seen at best (often among Thomists themselves) as one option among many others. 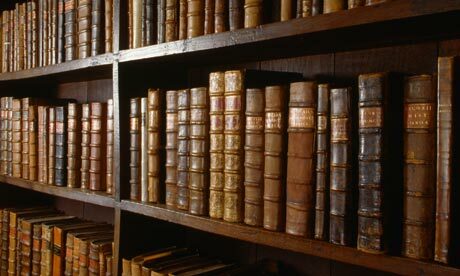 The restoration of Thomism requires a translation of Scholastic-Thomistic works into a current universal language, such as English. The project thus expects to have a great impact on both university and seminary education by making available in English to seminarians and university students the scholastic manuals that have been in a sense hidden away from them in the last five decades. Fundraising: The Ite ad Thomam Translation project depends on generous donors for its existence. Translating texts from Scholastic Latin into English is not quite a glamorous job. It is a slow, meticulous, and financially unrewarding task, and it is no wonder so few are interested in doing it. It not only takes hours just to translate a handful of pages, but it also presupposes years of training in subject-specific skills with very little job-market value. Moreover, translation comes with little to no academic recognition, so scholarly prestige is not earned in the process. And unfortunately for translators, publishers today tend to keep most of the little profit they get from sales. If a translator gets any royalties at all, it is usually a very small percentage of the editor's revenue, and it is often not monetary at all (but in the form of free copies of the book). For this reason, fundraising is an important part of making a translation possible. We ask you to consider the importance of this project and make a generous financial contribution towards this noble endeavor. Works Proposed: For more information on which works are currently being translated, click here. Link to results page in Scribd.com.